Mykonos is a dream island and a perfect location to get married. The idyllic landscapes, the warm weather, the lifestyle of the island, the big number of chapels and a very well organized wedding planning service, will make the most important day of your life a vibrant and lovely memory – both for you and your guests! During the last few years, many couples choose one of the Greek islands to get married at. Among them, the most cosmopolitan one is definitely Mykonos! Most luxury hotels and concierge agencies on the island offer wedding plan services. You only need to explain to them what your dream for your wedding day and they will prepare everything to the smallest detail. Little Venice is a picturesque neighbourhood right on the seaside of Mykonos Town. The buildings are stitched to each other creating a wall against the splashing waves. The whole scenery will remind you of Venice, Italy and that is how Little Venice got its name. At the opposite side of the bay, you can see the Windmills, the trademark of the island. Both Little Venice and the Windmills offer magnificent sunset views and a perfect background for your wedding photos! Getting married on the beach has become a trend, as the peaceful sea and the golden sand create the ideal atmosphere for a wedding. Southern beaches of Mykonos offer a lot of space for all your guests and big beach-restaurants can serve as your lavish wedding reception. If you like getting in contact with nature, go ahead and organize a barefoot wedding on the beach. It will be much convenient for everybody, especially when you all will be dancing! Mykonos has more than 500 chapels and churches – which literally means there is a church everywhere! 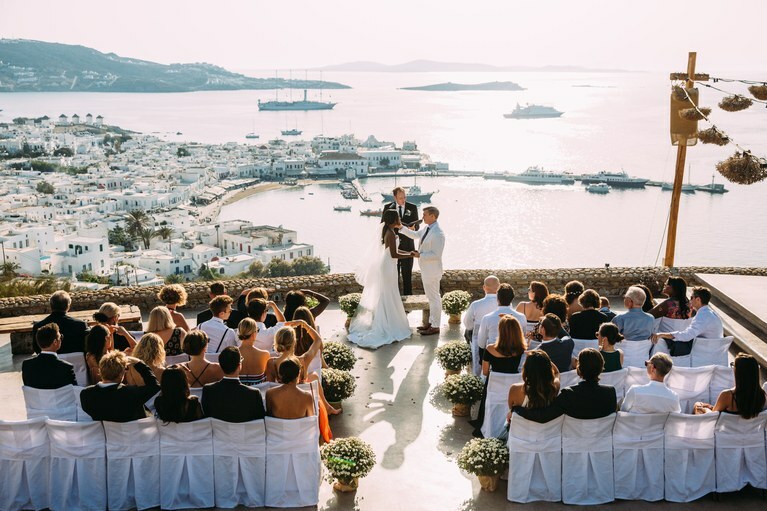 It can be a small chapel on the edge of a cliff in a remote surrounding or a bigger church in Mykonos Town – they all offer the most beautiful spot for your wedding ceremony. Most Mykonos churches were built with the traditional Cycladic architecture (cubic and simple) and some of them are 5 or 6 centuries old. They are all white with blue or red domes. You will even find private chapels that operate only for ceremonies. 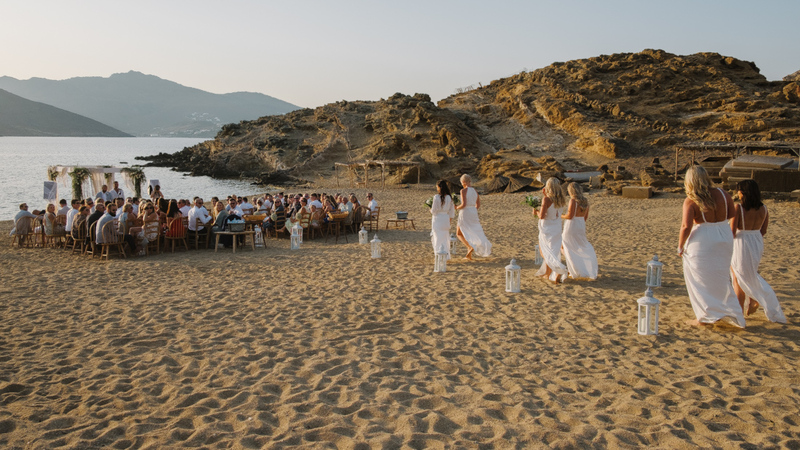 If you are looking for a more unusual wedding location, you can easily find it in Mykonos. Your agent can book some of the local attractions such as the Windmills or the old Castle. A nice option, especially for your wedding party, is the 180 Sunset Bar just above the charming Mykonos town. Remember, in Mykonos everything is possible so don’t hesitate to ask for what you would really want, no matter how unusual it seems! A wedding in a Mykonos Villa is the option that many couples choose. 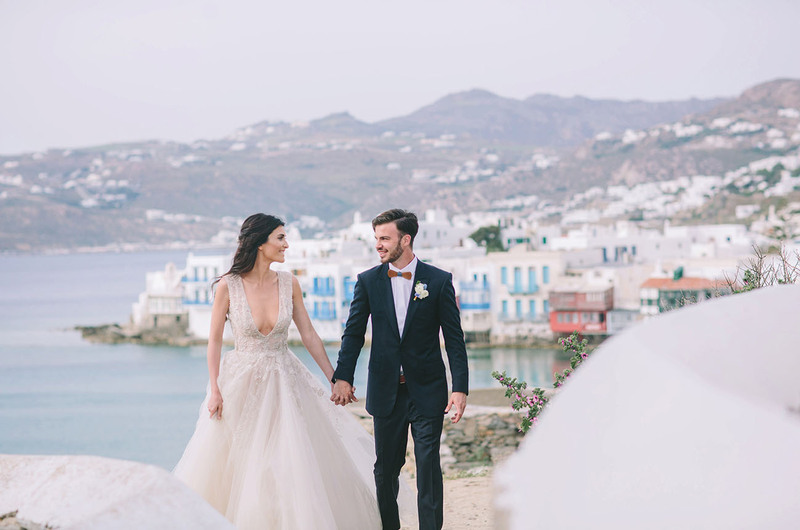 Mykonos Luxury Villas offer a lot of things that would make your wedding a dreamy event and create some of the best memories in your and your guests’ life. There are plenty of really beautiful villas for rent, in various locations and with different capacity. The biggest ones offer a lot of space that could be used for a wedding party or as accommodation for the couple and some of the guests. Most of them have large landscaped gardens, infinity swimming pools and astonishing views to the Aegean, all of which create a perfect environment for your wedding. 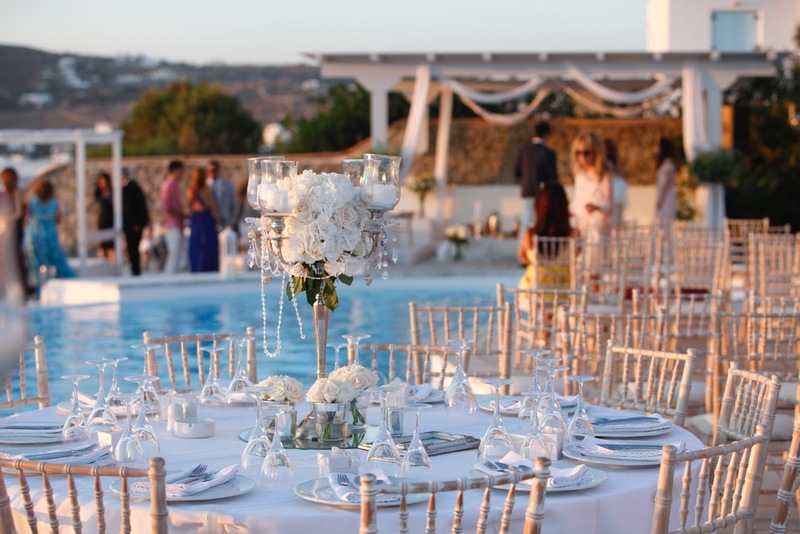 Some Mykonos Villas rental agencies offer high-quality concierge services and have a lot of experience in preparing a wedding. They can arrange everything you may need, from chauffeurs and chefs to your ceremony, from the flowers to the rings.